John Irving has been nominated for a National Book Award three times--winning once, in 1980, for the novel "The World According to Garp". In 1992, Irving was inducted into the National Wrestling Hall of Fame in Stillwater, Oklahoma. In 2000, he won the Oscar for Best Adapted Screenplay for "The Cider House Rules". In 2001, he was elected to the American Academy of Arts and Letters. 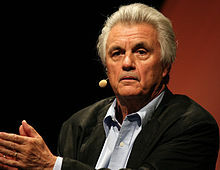 The following is a personality profile of John Irving based on his work. John Irving is unpretentious, sentimental and easily rattled. He is unconcerned with art, he is less concerned with artistic or creative activities than most people who participated in our surveys. He is intermittent as well: he has a hard time sticking with difficult tasks for a long period of time. But, John Irving is also laid-back: he appreciates a relaxed pace in life. Considers helping others to guide a large part of what he does: he thinks it is important to take care of the people around him. He is also relatively unconcerned with taking pleasure in life: he prefers activities with a purpose greater than just personal enjoyment.